My name is Yo Takimoto. I'm a traveling woodcarver. I don't try to be an artist. Artists usually want to make shapes. I don't want to do that. For me, I'm not an artist. I just respect the wood. I like the natural shape of the wood. I can get a very good energy from the wood. I like to touch wood a lot. This is very important. Woodcarving is a handcraft. In Japan we had a very interesting period, it's called the Jomon. It's a stone age in Japan. People in the Jomon Period loved natural rock. They used their hands a lot in nature. I think that my woodcarving is very similar to things people did in Jomon Period. I was a small boy. All the Japanese young people do this kind of thing. Usually they had the older boys teach to the younger children. Then I used to work as a city planner in a big city, a crazy city - Tokyo. For 20 years. I got too stressed. A very good friend of mine gave me a carving knife as a Christmas present. Then I started woodcarving again. I had forgotten how to for more than 35 years. Living in a big city, I just wanted to do the woodcarving. When I got too stressed I used my hands to feel very close to nature, which was very important. What motivated you to teach woodcarving to others? I want people to do woodcarving. I want people to respect the wood and respect nature. I don't want people to make a certain shape that they want right away. I want them to ask the wood. I believe that the most beautiful shapes are natural shapes. Most of my pieces are not functioning pieces, but I think it's beautiful. We are human beings and we try to do too much to nature. Even in Japan, Japanese people destroy nature. They shouldn't do that. In my woodcarving I want people to feel close to nature. Even touching the wood will give a very good energy from nature. I want people to enjoy using their hands. That's my workshop. I prefer to have my workshop in nature, like a forest. Many people are living in big cities. I want people to feel nature even when they are living in big cities. In Japan I have workshops in Tokyo. But I do like to travel, like all around the countryside of Japan. 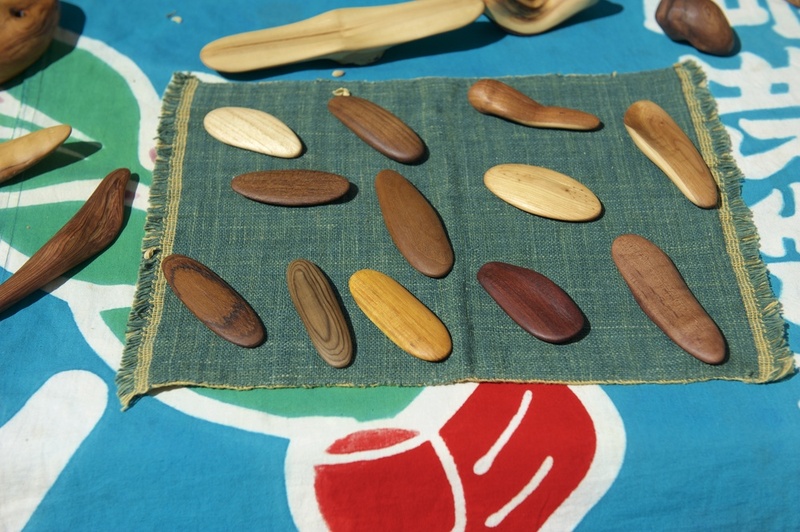 Do you have a favorite type of wood to carve? I do like Japanese cedar, sugi, and also the American bristlecone pine. The bristlecone pine does have a very beautiful natural shape. Shows blisters and calluses on his palms. Usually I hold the carving knife with my right hand, but my left hand is working much more because I hold the wood with it. I think I like my hands a lot. Yo Takimoto in Venice, California on June 12, 2016. Photographs by Julia Girardoni.